Written by Guest post on Wednesday, 10 April 2019. Easter often means chocolate, chocolate and well…more chocolate! Whilst it’s perfectly fine to enjoy a chocolate egg, sometimes Easter can leave us feeling lethargic and so full of sweets that we never want to see a chocolate bunny ever again! Why not try something a little healthier this year? This cocoa ‘nice cream’ will satisfy your sweet tooth and provide that 'chocolatey’ hit without heaps of extra added fats and sugars. The best bananas to use for this recipe are those that are very ripe and spotty. These make the ‘nice cream’ extra sweet! Slice them and pop them in the freezer ahead of time so they're ready when you want to make this yummy dessert..
518kJ (124 Calories), 3.5g protein, 1g fat (including 1g saturated fat), 24g carbohydrate (including 19g sugars), 4.5g fibre and 18.5mg sodium. *Based on medium bananas; does not include the optional honey. 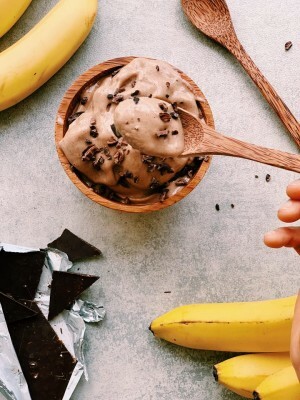 Simply blend the frozen bananas, cocoa powder, milk and honey (optional) until it resembles a soft-serve like texture. If the bananas melt a little during the blending process, scoop the mixture into a container and re-freeze for another 20-30 minutes. Serve immediately with topping of choice. Note: I started with 300 grams of unpeeled bananas which became 200 grams in weight once peeled. Add ½ cup frozen berries to the blend. Add a dash of vanilla, almond or coconut essence or a pinch of cinnamon. Make a 'green' Nice Cream by adding a handful of chopped spinach to the mix! The bananas will mask the taste of any spinach. For something nuttier, add a little peanut butter into the mixture.